*** Approximately 7,000 North Carolina soldiers were either killed, wounded, or captured at the Battle of Gettysburg. Today is the anniversary of the dedication of the cemetery at the Battlefield. The remains of North Carolina soldiers were moved to Raleigh’s Oakwood Cemetery beginning in 1871. View a printed copy of the September 22, 1862 version on the Library Congress’ website here. Our Star spangled banner will wave no more over us as a free united & happy people. To see her day of Glory pass away. And scatter peace and civil rights away. Sources: Thomas C. Parramore, F. Roy Johnson, and E. Frank Stephenson, Jr., eds. Before the Rebel Flag Fell. (Murfreesboro, NC: Johnson Publishing Company, 1965). Came Mr Lincoln’s Inaugral. I scarcely know which to dwell most on, its wickedness or its weakness! The cloven foot is there & an attempt made to draw a drapery around it — an attempt which fails so signally as to excite ones contempt. Rode with Patrick. Had a long & gloomy talk about the state of our country. I hope no one will say any thing more about SC to him. It needs but the spark to fall upon the carded flax. Went to the Ploughs & the Ditchers. At Father’s. Could I have believed that any Southern person could find any thing to commend in Lincoln’s message? But so it is. Mama & Sue both think “he means well”! Heaven save the mark! Father does not like it & looks gloomy. Lincoln’s intense vulgarity disgusts him, his talk about “running the Machine as he finds it” revolts every sentiment of good taste. Rather say he will drive in his wedge where he finds the split & that Mr Lincoln will be Mason & Dixon’s line Virginia surely cannot stand every thing, nor can this so called “Peace Congress” long throw sand in her eye. Should she secede, what an odd position N Carolina would occupy, fairly “squeezed” out of the Union. Mrs Lincoln’s invitation to Mr Buchanon to stay with them when he came to Washington must have made him wince, for he at least understands how gentle folks ought to behave. Ever since arriving in Washington I had a great desire to work for the ladies of the White House, and to accomplish this end I was ready to make almost any sacrifice consistent with propriety. “Pshaw! Nothing is impossible. I must have the dress made by Sunday;” and she spoke with some impatience. “I am sorry,” I began, but she interrupted me. With a nervous step I passed on, and knocked at Mrs. Lincoln’s door. A cheery voice bade me come in, and a lady, inclined to stoutness, about forty years of age, stood before me. I bowed myself out of the room, and returned to my apartments. The day passed slowly, for I could not help but speculate in relation to the appointed interview for the morrow. My long-cherished hope was about to be realized, and I could not rest. Tuesday morning, at eight o’clock, I crossed the threshold of the White House for the first time. I was shown into a waiting-room, and informed that Mrs. Lincoln was at breakfast. In the waiting-room I found no less than three mantua-makers waiting for an interview with the wife of the new President. It seems that Mrs. Lincoln had told several of her lady friends that she had urgent need for a dress-maker, and that each of these friends had sent her mantua-maker to the White House. Hope fell at once. With so many rivals for the position sought after, I regarded my chances for success as extremely doubtful. I was the last one summoned to Mrs. Lincoln’s presence. All the others had a hearing, and were dismissed. I went up-stairs timidly, and entering the room with nervous step, discovered the wife of the President standing by a window, looking out, and engaged in lively conversation with a lady, Mrs. Grimsly, as I afterwards learned. Mrs. L. came forward, and greeted me warmly. “Among others, Mrs. Senator Davis has been one of my best patrons,” was my reply. The terms were satisfactorily arranged, and I measured Mrs. Lincoln, took the dress with me, a bright rose-colored moire-antique, and returned the next day to fit it on her. A number of ladies were in the room, all making preparations for the levee to come off on Friday night. These ladies, I learned, were relatives of Mrs. L.’s,–Mrs. Edwards and Mrs. Kellogg, her own sisters, and Elizabeth Edwards and Julia Baker, her nieces. Mrs. Lincoln this morning was dressed in a cashmere wrapper, quilted down the front; and she wore a simple head-dress. The other ladies wore morning robes. I was hard at work on the dress, when I was informed that the levee had been postponed from Friday night till Tuesday night. This, of course, gave me more time to complete my task. Mrs. Lincoln sent for me, and suggested some alteration in style, which was made. She also requested that I make a waist of blue watered silk for Mrs. Grimsly, as work on the dress would not require all my time. Tuesday evening came, and I had taken the last stitches on the dress. I folded it and carried it to the White House, with the waist for Mrs. Grimsly. When I went up-stairs, I found the ladies in a terrible state of excitement. Mrs. Lincoln was protesting that she could not go down, for the reason that she had nothing to wear. Thus urged, she consented. I dressed her hair, and arranged the dress on her. It fitted nicely, and she was pleased. Mr. Lincoln came in, threw himself on the sofa, laughed with Willie and little Tad, and then commenced pulling on his gloves, quoting poetry all the while. “You seem to be in a poetical mood to-night,” said his wife. “Yes, mother, these are poetical times,” was his pleasant reply. “I declare, you look charming in that dress. 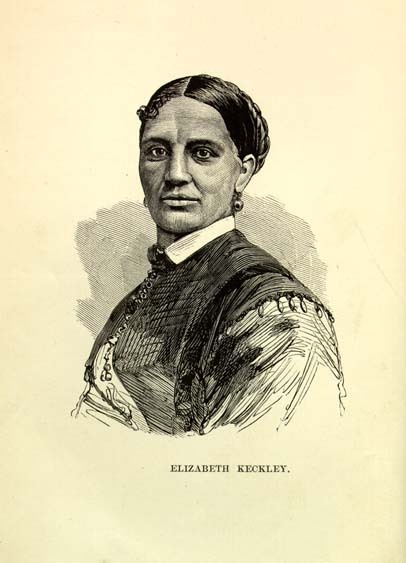 Mrs. Keckley has met with great success.” And then he proceeded to compliment the other ladies. Mrs. Lincoln looked elegant in her rose-colored moire-antique. She wore a pearl necklace, pearl ear-rings, pearl bracelets, and red roses in her hair. Mrs. Baker was dressed in lemon-colored silk; Mrs. Kellogg in a drab silk, ashes of rose; Mrs. Edwards in a brown and black silk; Miss Edwards in crimson, and Mrs. Grimsly in blue watered silk. Just before starting down-stairs, Mrs. Lincoln’s lace handkerchief was the object of search. It had been displaced by Tad, who was mischievous, and hard to restrain. The handkerchief found, all became serene. Mrs. Lincoln took the President’s arm, and with smiling face led the train below. I was surprised at her grace and composure. I had heard so much, in current and malicious report, of her low life, of her ignorance and vulgarity, that I expected to see her embarrassed on this occasion. Report, I soon saw, was wrong. No queen, accustomed to the usages of royalty all her life, could have comported herself with more calmness and dignity than did the wife of the President. She was confident and self-possessed, and confidence always gives grace. This levee was a brilliant one, and the only one of the season. I became the regular modiste of Mrs. Lincoln. I made fifteen or sixteen dresses for her during the spring and early part of the summer, when she left Washington; spending the hot weather at Saratoga, Long Branch, and other places. In the mean time I was employed by Mrs. Senator Douglas, one of the loveliest ladies that I ever met, Mrs. Secretary Wells, Mrs. Secretary Stanton, and others. Mrs. Douglas always dressed in deep mourning, with excellent taste, and several of the leading ladies of Washington society were extremely jealous of her superior attractions. Today was inaugurated that wretch Abraham Lincoln President of the US. We are told not to speak evil of Dignities, but it is hard to realize he is a Dignity. Ah! would that Jefferson Davis was our President. He is a man to whom a gentleman could look at without mortification as cheif of his nation. “How glorious was the” President elect on his tour, asking at Railway Stations for impudent girls who had written him about his whiskers & rewarding their impudence with a kiss! Faugh! Sweet Republican simplicity how charming thou art, when the future head of a great nation, a man upon whom all eyes are bent measures his august person inch by inch with a visitor whom he fears is taller than himself & chuckles to find himself mistaken. But then Saul was a head & shoulders higher than the multitude — why should not Abraham rest his importance on his stature? How dignified was his entrance in disguise into his future Capital. How grateful should we be to the long cloak & Scotch Cap which saved him from the bloody designs of his Southern enemies. Well, we have a Rail Splitter and a tall man at the head of our affairs! Ned Bartley is both & perhaps excels Mr Lincoln in one or both points, but then he is not of Anglo Saxon blood. Neither is the Vice President Mr Hannibal Hamlin. Gentlemen we can match you on all points to a nicety. Ah my country! God keep you when such hands hold the helm! Went to the nursery. Noticed an Aldermanic development about one or two of the children & called Gatty’s attention to it. She said, “Miss, I’se give them chillun worm seed fried & worm seed biled & it dont do em no good. I have laid off to ax Master for some worm draps.” I taxed Dicy with dirt eating which she vehemently denied until most traiterously Ailsie stepped in & said, “Now Dicey you know you does.” “& how do you know Ailsie?” “I seed her when we went to the spring & she give me some”! So Dicey & Ailsie were put on a course of rusty nails & Vinegar, with severe threats for the future if they continued it. Today old Abe Lincoln takes his seat as president. Today old Abe Lincoln takes his seat as president. Mr. Henry & Mr. Hendrix went to Asheville … Terry said he would give possession of the house & hotel in two weeks. Mr. Henry got some cups & saucers, the children some candy, me a pair shoes & some cloth for sacks for wheat & other bolt for flour. I made sacks for wheat at night & mended some old coffee sacks. John got back from Haywood Saturday night with the wagon. Cleaned the yard all day Sunday. I began to work a skirt today. Sister Jane gave me one ready pointed so I layd off another like it. Atheline stewed some fruit & I made the pies after dinner. Diary of Cornelia Henry in Fear in North Carolina: The Civil War Journal and Letters of the Henry Family. Clinard, Karen L. and Russell, Richard, eds. (Asheville, NC: Reminiscing Books, 2008).